Yes, we have to do another kitty post. But this one's different, a matter of international interest. News from Afghanistan may be grim, but everyone can find solace in these images of lost or abandoned kittens rescued by U.S. marines. Brian Chambers, Chris Berry and Aaron Shaw have adopted kittens they found while on duty - and sent them back to the States to wait for them with the marines' families (with the aid of these groups.) Says Chambers, "At only 3 weeks old, their mother had disappeared and they were left alone to live rough and fend for themselves like the other cats in this area. We looked after them both and they lived in a box in the office, after a week they were allowed to roam around during the day and sleep with us in the hooch at night." 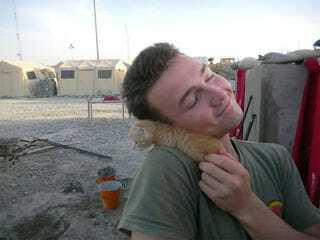 I found Keykey tangled up in c-wire one day in the beginning of the deployment, I took him in and fixed his wounds. He was also extremely malnourished so I constantly kept an eye on him and fed him until he got back to good health and he has been by my side ever since. Obviously, this is a situation where everyone benefits from the affection. Check out all the images here — we're not ashamed to reveal that we teared up. UPDATE: We heard from Brian Chambers, who wanted to make sure due credit was given to the organization Nowzad Dogs. This Facebook page is devoted to helping bring kittens to safety! These were the organizations that helped in this story.